In the Noticing New York review of the still in-the-theaters “Battle For Brooklyn” (concerning the Atlantic Yards travesty) I wrote, “given the potential breadth of the entire story there is a lot that the film makers’ necessarily left out.” I then gave some examples. Most of what had to be excised from a 90-minute film, if included, would have been extra damning of the cabal of mega-project supporters Bruce Ratner collected around him while waving cash for those willing to sell out the community for private benefit. One big piece of the story left out of the film is the role of ACORN. 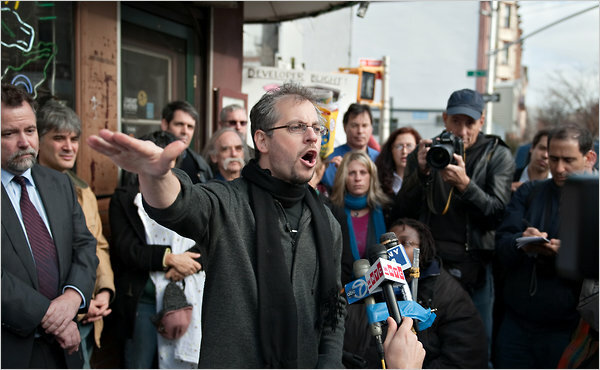 A deleted scene from the movie involving ACORN has been uploaded to the web by Michael Galinsky, one of the film makers of “Battle For Brooklyn.” As a piece that wound up on the cutting room floor, it is a good clue to the superfluity of superb material the film makers amassed and had to make choices about. Bertha Lewis - ACORN scene from BfB from rumur on Vimeo. You may want to watch the clip more than once. There is perhaps more to explain Ms. Lewis’ resolutely loyal and obtuse reflexiveness in defending Mr. Ratner than immediately meets the eye. The 2005 exchange occurred on May 19th. That means it was two days after the May 17th date of a “Memorandum of Understanding” that Ms. Lewis had already signed with Mr. Ratner. Noticing New York has covered this MOU before: Saturday, June 28, 2008, Selling out the Community for Beans (A Giant Wrong). Essentially that MOU limited Ms. Lewis’s options. One might even say it contractually obligated Ms. Lewis to be so obtuse. • Contains a confidentiality provision that prevented ACORN and Ms. Lewis from sharing negative information about the mega-project that they might have had (but the rest of the public might not). If Ms. Lewis had insider information that what Mr. Goldstein was saying was correct she was not at liberty to admit it. • The confidentially provision ensuring a mute Ms. Lewis/ACORN was the only thing “specifically enforceable” under the MOU terms. That all makes a close watching of the video worthwhile. Others may conclude that none of the above was specifically on Ms. Lewis’ mind as she forcefully tells Mr. Goldstein that his concerns don’t bother her. It may have been as simple as she had decided she had teamed up with Ratner and that was that. But here is something else. In May of 2005 ACORN was, unbeknown to others at the time, covering up an internal embezzlement scandal (it lasted for eight years) involving its top management. (See: Thursday, July 24, 2008, Falling Acorn! How Far from the Tree?) Concealment of the embezzlement by senior ACORN executives lasted until it was revealed by a whistleblower in May of 2008. Forest City Ratner then bailed ACORN out with $1.5 million in August of 2008. • At the May 19th press conference Lewis was promoting a 50/50 deal where 50% of the mega-project’s units were ostensibly to be subject to affordability restrictions, that was not the case. For starters, all the contemplated condominium units in the megadevelopment were luxury units not subject to affordability restrictions. • With respect to the remaining rental units there was no real commitment to provide affordable housing. Anyone who earned an annual income from $38,407 to $46,086 (HUD family of four standard) was not going to be provided with affordable housing, by virtue of their specific exclusion under the MOU terms. That was a clue to the benefit ACORN wasn't negotiating. ACORN cannot be said to have negotiated to have any affordable units included in the project for families with lower income than that because such units would automatically be provided by the federal tax code. Then skipping over the units ($38,407 to $46,086) that were not being provided, one finds that one is dealing with units that are renting for $3,000 a month, $2,300 a month, $1,500 a month: Units that the market would be providing anyway. In other words, ACORN basically negotiated that Forest City Ratner would provide absolutely nothing in terms of affordable housing. • ACORN’s agreement permitted minuscule units and therefore rental of “affordable apartments” at higher per square foot rents than the market-rate apartments. We won't go on . . .
As you can gather by now, had the film makers decided to include the unused scenes about ACORN in their film they would have been faced by a daunting chore in how much there was to communicate to the audience about ACORN, the devil being in quite a few ignominious details. I Went To See “Battle For Brooklyn” This Weekend and You Should Too Because . . . . 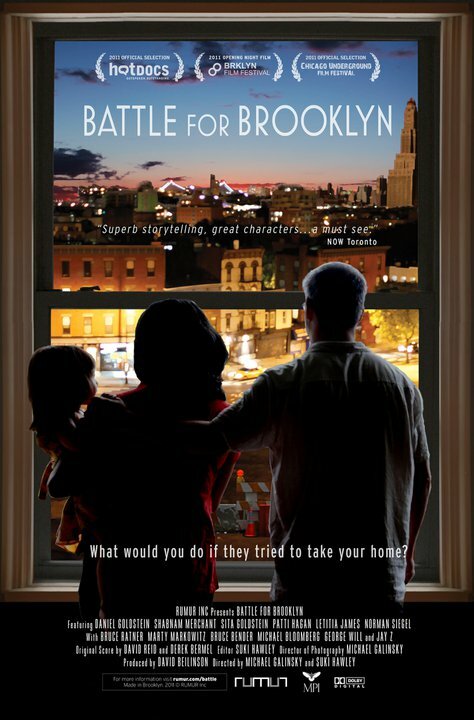 I went to see “Battle For Brooklyn” this weekend, the new documentary about the Atlantic Yards Brooklyn debacle. Noticing New York readers should go see it this weekend, too. You should go because it is a good film and also because it is about crucial issues that need a great deal more public attention. If you and enough others see the film this weekend at the Cinema Village (22 West 12th Street in Greenwich Village) when attendance figures are being monitored the film will get wider play and those issues will get more of the attention they deserve. If that is all the convincing you need then hurry out to see the film, bringing friends and we can all reconnoiter latter. If you need to hear more before you’re out the door with ticket price in hand then keep reading. To repeat, “Battle For Brooklyn” is a good film. How good a film is it? I’m not sure how authoritatively I can make pronouncements on that just yet . . .
. . . Occasionally, Noticing New York ventures into documentary film review territory (Tuesday, November 16, 2010, Client 9 (Spitzer): Divided by 3, No 2 Ways About It and Saturday, April 30, 2011, A List of Reasons Lovers of New York Should See “Bill Cunningham New York,” A Documentary About Photographing New York Fashion) but in the case of “Battle For Brooklyn” I haven’t finished sorting out my thoughts. For one thing, it is a challenge for me to sift out the already existing perspective I have on the cause reported about in the film, knowing what I already know and having experienced what I have already experienced. I know or have personally encountered nearly everyone featured on screen during the course of the film. The biggest problem for me in evaluating the film with full objectivity is that it is structured around the personal story of Daniel Goldstein, an activist for whom I have extraordinary personal respect. Among other things it captures Daniel on film a few years before I ever met him and his emergence as a leader in the anti-eminent domain abuse cause. At first he is reluctant even to take a seat with those stepping up to lead the fight. Then there is a scene where after he somewhat haltingly reads a prepared statement at a press conference he ventures, “I think I like this.” Finally, you see him assuredly and intuitively striking the right pitch-perfect tone with reporters and press representatives, one after another. . .
. . . It’s no wonder, as is dealt with in the film, that muzzling Goldstein with a gag-order agreement was one of the things Forest City Ratner (and complicit state officials) wanted to exact as a condition of paying Mr. Goldstein the money to which he was legally entitled as not very satisfying compensation when they seized his home. (Goldstein refused to sign the gag order. )- - In providing its counter-narrative to the well financed PR fictions of the developer, much of the film is about the strong arm tactics attempted by Ratner to control the public narrative. I didn’t meet or know who Daniel was until 2007. When I met him a fair amount of criticism had been leveled at him. Some of it came from the goonish thugs who were essentially on Forest City Ratner’s payroll (Forest City Ratner being the subsidy collector looking to seize the 22 acres involved in the fight). Their criticism was easy to dismiss. There were also people who considered themselves to be tactical moderates; they argued for some unspecified course of compromise. Those people tended to have an insufficient understanding of what they were up against, including the venality of certain key politicians involved. The proponents of tactical compromise were ultimately proved wrong. Finally, there were those who critiqued that Daniel could be too angry, a “hothead.” That was something I never personally observed and you don’t see it in the film. Given what he has been fighting I always found Daniel’s conduct impressively well modulated. That’s what you see in the film. I arrived on the Atlantic Yards scene pretty much midway through the story (I spotted myself in only two brief moments in the film) but when I found out what was really going on with Atlantic Yards I found myself very angry too. * The more details I found out about the angrier I was. While I think my anger was appropriate it inevitably factors in when trying to appropriately temper one’s statements, particularly when speaking to the less, or uninformed. The Greatest Story that Could Be Told? Mr. Will eventually did write a column excoriating the eminent domain abuse. 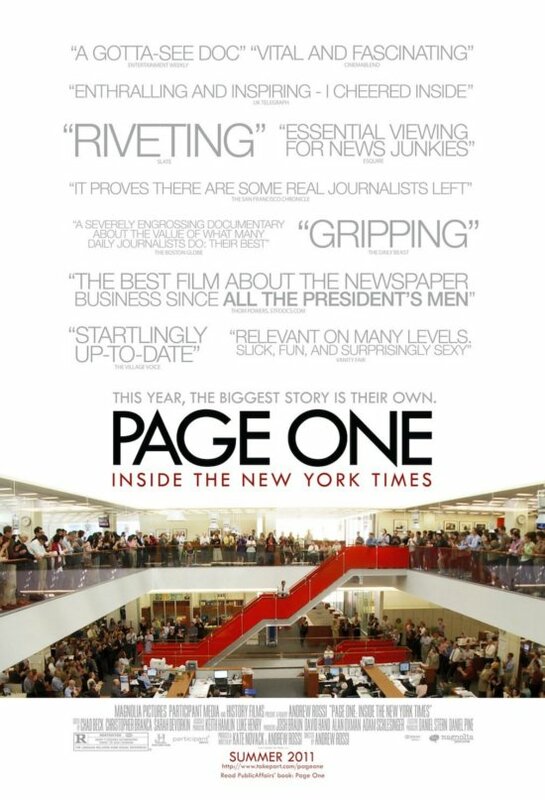 What the film doesn’t mention is that the New York Post, owned by media mogul Rupert Murdoch and editorially supporting Atlantic Yards, selectively decided not to run the Will column even though the standard practice of the paper was to regularly run Will’s other columns. Similarly, the film didn’t get into how, during the unfolding of the film’s events The Brooklyn Paper, once a very fine local community paper that provided nearly indispensable coverage criticizing Atlantic Yards was acquired by Rupert Murdoch and how, thereafter, coverage of major Atlantic Yards stories that were negative were peculiarly, but perhaps not so inexplicably, absent from its pages. Other things were not explicated in detail: The film did not have time to spell out the precise mathematics respecting how bids from other developers competing with Ratner were superior, how much subsidy in total (millions/billions) are being sent Ratner’s way under various circumstances or how many digits over those that get you to a million might be needed to calculate the amount by which public officials have sweetened the deal for Ratner since the beginning when the mega-deal was first announced. Similarly, near the end, the film notes that Goldstein and his family received “ample resources” with which to relocate from his seized home without going into the mind-bending complexity of exactly what that may mean in terms of the compensation Goldstein received after all his travails. 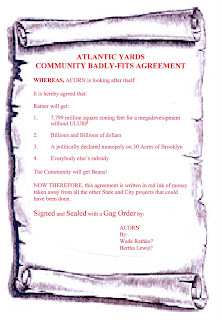 This is something Noticing New York was carefully attentive to in providing appropriate analysis: Tuesday, May 4, 2010, “$hhh!” A Thieving Developer Wants Daniel Goldstein Quiet About Its Misdeeds, Meaning the Atlantic Yards Fight Ain’t Over. Interestingly, the New York Times today ran its review of "Battle of Brooklyn" in its print edition on the same page as its review of “Page One: Inside The New York Times,” the new documentary about the New York Times. 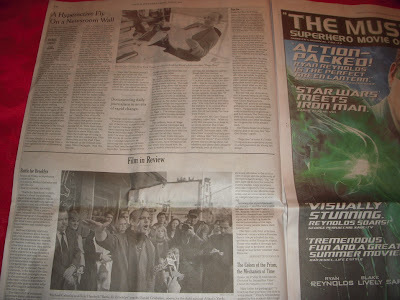 The review of “Page One” was above the fold occupying about half the page. The review for “Battle of Brooklyn” was below the fold occupying minimal column space but was accompanied by a large rendition of a Tracy Collins photograph (see below- I can catch myself in the background) elevating the stature of the coverage. But whereas the film contrasts the press releases and PR statements of the Ratner crowd with a counter narrative and corrective facts, the Times itself has often uncritically run stories based on such press releases and PR statements without the perspective and context of a counternarrative or fact checking. That gets us to the review of the documentary about the Times itself. The movie’s main theme, no surprise, is the struggle of The Times to survive in the age of the Internet. . . . . the danger of not sending reporters on trips with the president; how ABC has had to lay off 400 people. Then it’s back to the survival issue again (brief interview with author of a notorious Atlantic article predicting that The Times might be out of business within four months. . . . Then more about survival. Then more about Iraq. . . But the real star of the show isn’t a human being at all. It’s a building: Renzo Piano’s magnificent Times headquarters. “Page One” gives us tantalizing glimpses but never takes explicit notice. No journalist should work in conditions so glorious, and few outside The Times do. In 2009 the company sold and then leased back part of its headquarters to generate some needed cash. Interestingly, in recognition of the dangers of potential conflicts of interest the Times went so far as to engage a non-Times staffer to write the review of “Page One.” If only The Times could make similar adjustments for its other more problematic (and important to the public) conflicts of interest with Mt. Ratner. The film makers shot an impressive amount of footage (I myself saw them shoot an awful lot) of which the film represents the merest fraction. Therein lies the promise of potential sequels telling more of the story if this film is as successful as it ought to be. If enough of us see “Battle For Brooklyn” this weekend maybe such sequels will issue and be surprised and delighted as the mysteries of what is in as yet unused footage is unveiled. Meanwhile, for a round up of other reviews and perspectives Atlantic Yards Report has this coverage: Friday, June 17, 2011, The Times punts somewhat on Battle for Brooklyn (was film edited to make officials look bad? nah), and a review roundup.